We had a fabulous Easter. The weather was much better than predicted and there were no rain clouds in sight. 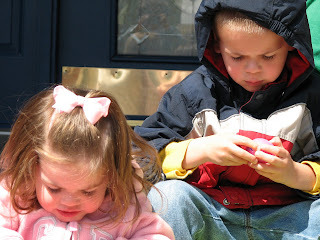 Of course, after the kids got their eggs, I couldn't get them to look up for a picture, so this is all I've got. Like 10 of these. The Wild Child is all about the chocolate. I had to confiscate about 10 million pieces of gum, because The Politician swallowed some because no one besides me knew that Razzles turned into gum. Didn't they see 13 Going On 30? 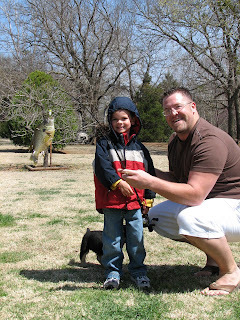 And of course, as is typical in the south(west), our day was capped off by a little fishing. Hard to see, but The Politician caught him a little fish. He ran up the hill waving his pole around so excited and managed to whap my mom and his aunt Bridge in the face with his fish. Hope you all had a nice holiday with your family! WC and P look so precious in their Easter outfits!!! You have some of the most gorgeous kiddos I've ever seen! 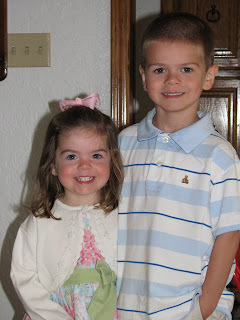 Great picture of the two kids in their Easter clothes - they are so cute! The fishing sounds fun too. Hope you've recovered from the sugar overload. Your children are adorable! How handsome the politician looks and I love the wild child's dress. Kay's Easter dress was a target find as well. Love that place!